When the temperature drops, Colorado nature really puts on a show. 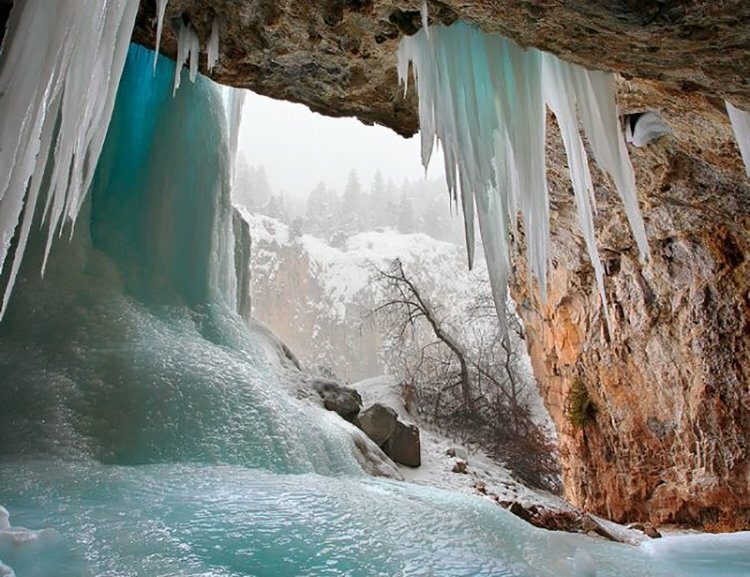 Take a trip into winter at its finest at the Rifle Mountain Park Ice Caves. Close to the entrance of Rifle Mountain Park, it's an easy hike into these natural beauties and is all-but guaranteed to be an experience you won't forget. The ice caves begin to form every year between December and February, and the ice doesn't totally melt until well into summer. 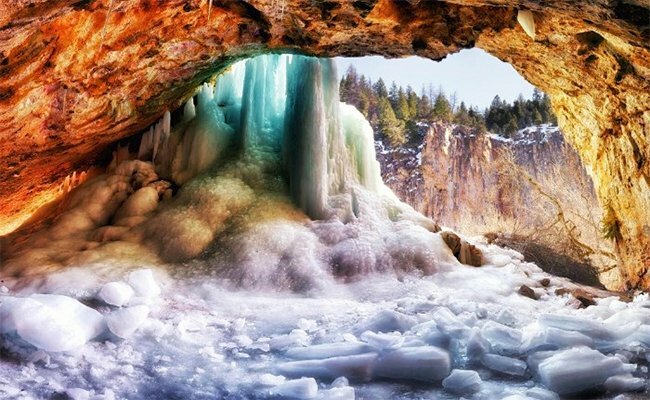 This winter phenomenon is created when water seeps through the limestone caves from the cascades of water flowing over canyon walls, freezing and thawing over and over again until the walls are covered with fantastical frozen formations. Icicles reaching gracefully downward from the ceiling often display a unique blue color that is really something to see. Simply step behind two of the frozen cascades to enter a magical, winter wonderland that you don't often get to experience. The caves, known as lower ice caves and upper ice caves, will often feature a floor of ice, so bring crampons or be extra careful around them. Both caves are known for their blue hues and glittering spires, letting you see nature in all her glory. The ice caves are an easy hike in, and it's less than a mile roundtrip to get from the parking lot to the site. Be sure to dress in layers and stay warm. Ice is awesome, but heading into these caves is like stepping into a natural freezer. Also, please, please, please pack out anything you pack in on your visit (at this park and all parks). We can only fully enjoy our state's wonders if we are respectful to the land and each other. If you see trash, pack it out with you and help keep the park clean. 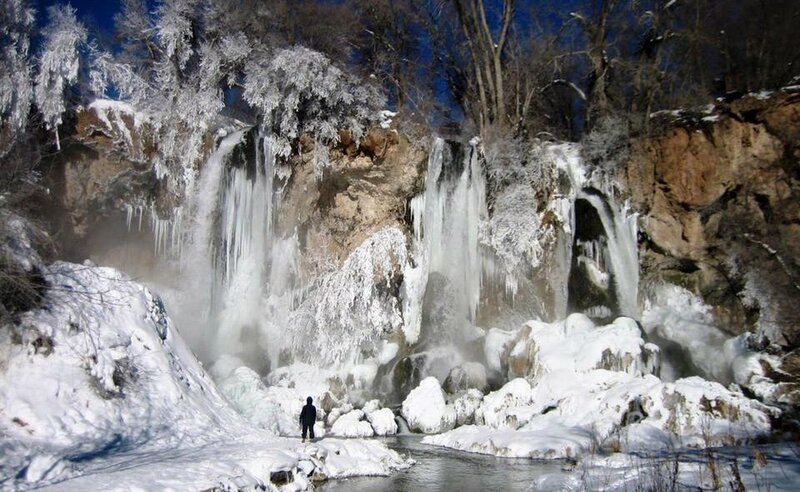 If you just can't get enough of the frozen stuff, then expand your trip with a stop at Colorado's triple waterfall, Rifle Falls State Park, just three miles away. These beautiful falls are a sight to behold year-round, but they are particularly inspiring in the winter freeze. Drawing nature lovers since 1884, it's an easy tenth-of-a-mile walk from the parking lots to the falls. There is a loop that also takes hikers above the falls and through several limestone caves (these are not ice caves, however); accessibility depends on trail conditions. Courtesy of Rifle Falls State Park. Please note that Rifle Mountain Park and Rifle Falls State Park both charge admission fees. Directions: From I-70, take State Hwy. 13 or Railroad Avenue (which becomes 13) North through Rifle. Take a right on Hwy 325 (bowling alley at the corner), this will head you toward Rifle Creek Golf Course and Rifle Gap Reservoir. Drive over the dam at Rifle Gap and continue on Hwy 325 to Rifle Falls State Park. The entrance for Rifle Mountain Park is about three miles further, about 2,000 feet after Highway 325 turns to gravel. Are frozen waterfalls your jam? Visit them while you still can! Find the one that interests from our list of frozen waterfalls across the state. Have you been to the Rifle Mountain Park Ice Caves? Share your photos with us in the comments. Springtime is near. Here are 6 amazing Spring Break road trips within 6 hours of Denver!